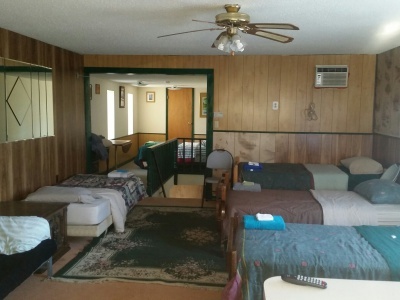 Room 1 has 3 full size beds and 1 twin bed. There is a full size bathroom with large walk-in shower. Guests in this room share the kitchenette with guests in Room 2. Room 2 has 5 twin beds. There is a full size bathroom with large walk-in shower. Guests in this room share the kitchenette with guests in Room 1. 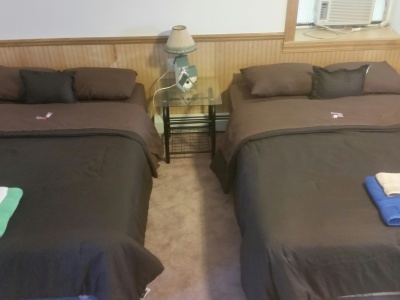 Room 3 has 1 full size bed and 4 twin beds. There is also a futon. 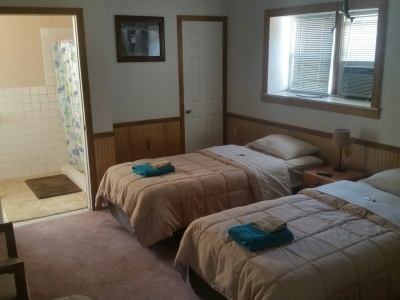 This room has a full size bathroom with a walk-in shower. Guests in this room have their own kitchenette.